A 7 X 30cm, six page colour concertina zine with B&W text on an orange paper wrap held in place by a pink circle sticker. In the borrowed costume for a Prince, with 'essence d'orient pearls' and a Finch, from Sadko, c. 1916. In the borrowed costume of the Chief Eunich from Schéhérazade, designed by Léon Bakst, c. 1910. In the borrowed costume for a corps de ballet dancer from Ode, c. 1928. In the borrowed costume of a Military Musician from Jardin Public, designed by Jean Lurçat, c. 1935. In the borrowed costume of a guest from Le Bal, designed by Giorgio de Chirico, c. 1929. In the borrowed costume for Petrouchka, designed by Alexandre Benois, c. 1913, with a Barn Swallow. 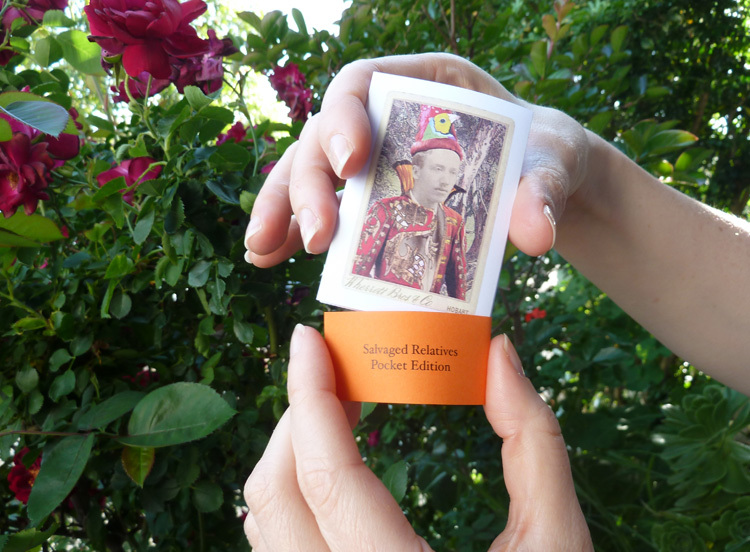 Our Salvaged Relatives Pocket Edition zine features in the February Book Arts Newsletter (No. 95, 2015, pages 42 to 43). 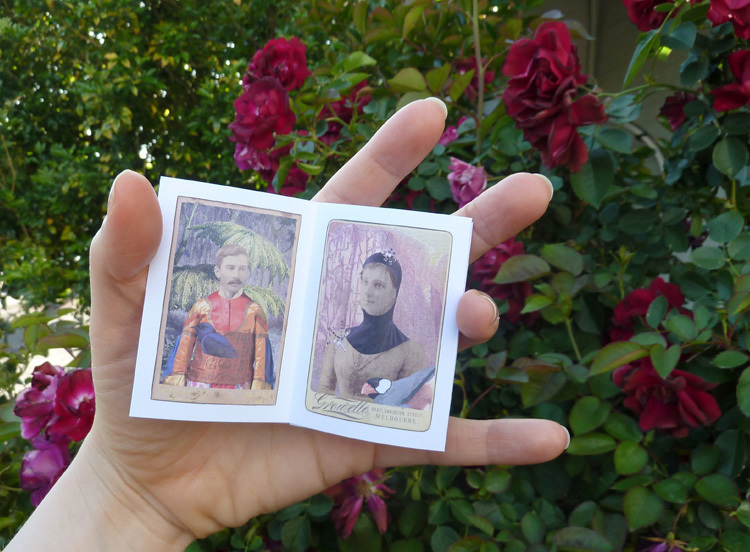 A Quartet of Salvaged Relatives in Borrowed Costumes for the cover of the November Book Arts Newsletter, No. 93, 2014, published by Impact Press at the Centre for Fine Print Research, UWE Bristol, UK, and edited by Sarah Bodman.